It is a story of two young women and their families in a remote village and how their tragedies transformed the small community. One of the young women, O-kayo, is drowned in the river near the village during one stormy night. She was trying to cross the river by a boat, which is the only means to cross the flooding river. Her father, Nihei, loses his mind and hits the bottle every night. O-kayo’s friend, O-sato, feels sorry for him. One night, she finds him heavily drank in the local bar, and tries to take him home. When they are crossing the river, Nihei chases the hallucination of his dead daughter, overturing the boat. Again, the river claims two more lives. O-sato had life insurance and her mother donates the money to the village so that they can build a bridge over the river. It’s only 40 minutes long, and probably meant to be a ‘filler’ for a matinée. The actors and actresses are not exactly stars of the era, and the director, Jiro Kawate, was considered mediocre at best at the time. The film was produced at Shinko Kinema, the subsidiary of Shochiku, specializing in low-budget films. The most interesting aspect of this film is the fact that it was produced by the Office of Postal Insurance. The film was meant to be a propaganda to boost sales of the insurance. In 1930, Mukden Incident caused a havoc in defense budget, and the following fifteen year war escalated wild spending by military to the unprecedented scale. This bottomless expansion of the military was supported by government loan (war bond), most of them were underwritten by Bank of Japan. Even though BoJ could buyout the issued bonds, maneuvering could only be temporary and the government desperately needed revenue. Ministry of Finance created the division called National Savings Promotion, which led propaganda activities on personal finance. They encouraged people to save money in Postal Savings. Then, they encouraged people to buy Postal Insurance as well. The private sector of insurance industry had been rather small and many companies targeted richer class as their customers. You see the insurance salesmen were visiting affluent neighborhood for door-to-door sales in Mikio Naruse’s “Flunky, Work Hard (1931)“. Postal Insurance was designed as a social insurance program for lower class. It didn’t require medical check or review, to which many people were reluctant. The policy itself was very affordable, and payment was small. The idea was to collect small, but from many. Office of Postal Insurance had been waging propaganda campaign with leaflets, posters, commercials, advertisements, and other media. This film was one of them. “Maiden Bridge” was released in Japan domestically first in early 1936. It was scarcely noticed but rented out for several years to reach wider audience for propaganda purpose. That must have included colonial regions, such as Korea and Taiwan. It appears one of such prints survived in Taiwan. The title credit says the original story was by the Office of Postal Insurance and adapted for screen by Kawate and Kaneto Shindo. Then, this personal sacrifice story was the idea of the bureaucrats at the time. They didn’t think it was government responsibility to build a bridge over the river. They rather wanted poor girl’s insurance money. They didn’t even consider the plot, in which the government budget strengthened by Postal Insurance could build such bridges. It is abhorring to see the government office asking the personal sacrifice twice, life and life insurance, in straight face. I wonder, what went through the mind of young Kaneto Shindo, who went on to become prolific writer and director after the war, especially noted for the theme humanity and social issues. Acting seems somewhat forced, especially Yutaka Mimasu, who played Nihei. Cinematography by Asakazu Nakai is superb, however. Nakai is especially notable for his work in Kurosawa’s films in later years, such as “Ikiru“, “Seven Samurai” and “Throne of Blood”. In “Maiden Bridge”, Nakai captured the tranquil scenery of the rural village, sometimes through gauzy soft focus. In some scenes, the composition emphasizes depth to create a realistic space. In 1935, the year before the film’s release, Taiwan was hit by a deadly earthquake, “Shinchiku-Taichū earthquake”. The death toll was more than 3,200, and more than 40,000 houses and buildings were destroyed. According to the contemporary record, 147 claims of Postal Insurance were filed and rewarded. I don’t know how effectively these propaganda efforts were played out in colonial regions, but according to the “History of Postal Insurance and Pension” published in 1936, the awarded were all Taiwanese. In the same book, the current and future strategy for colonial regions was discussed but mainly in the context of protection of Japanese living in these areas. It may well be that Taiwan was considered ‘assimilated enough’ since it had been under the Japanese colonial rule for more than 40 years at the time. In any case, opportunistic and chauvinistic attitudes are prevalent in those discussions and, yes, that’s what colonies were for. 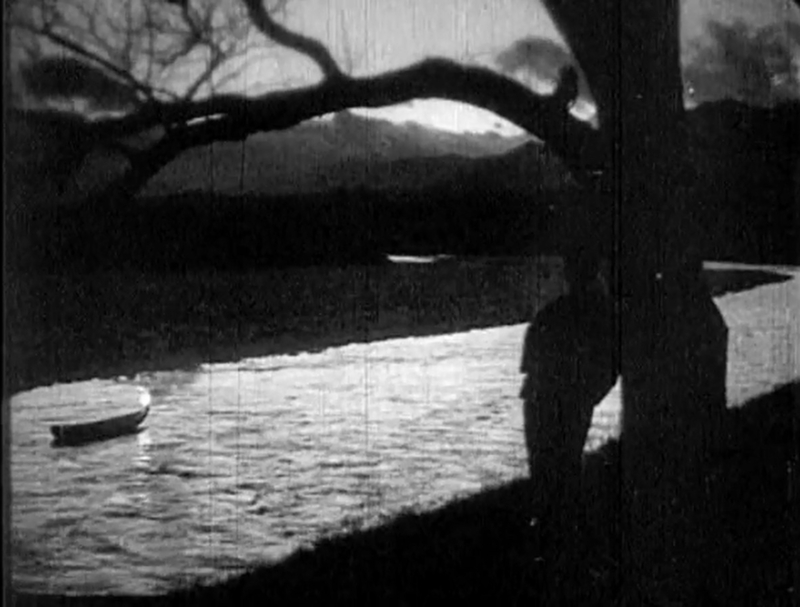 In the last scene, the village council members and the girl’s mother release the cursed boat down the river. The village master puts the flamed torch on the bow and lets the water carry the boat. The river carries the empty boat down the river under dusk. The ritual of sending off the souls down the river is beautifully, beautifully captured on celluloid. It is horrifying to see such a thoughtless, distasteful story decorated with such a beautiful sequence.